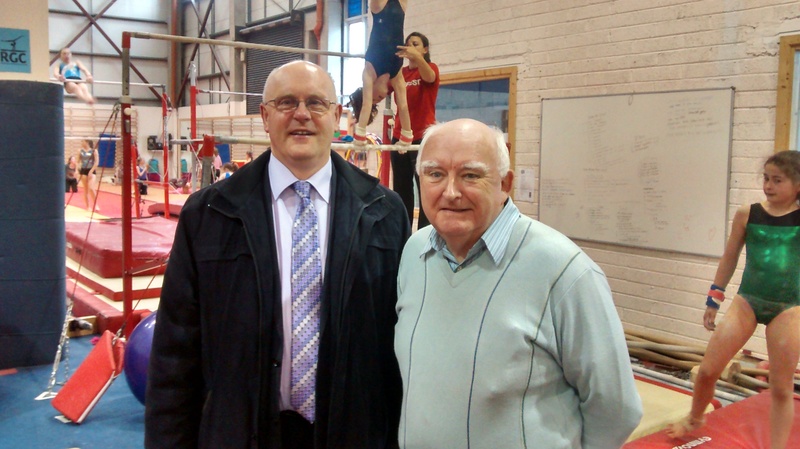 Last week we were delighted to have Councillor Declan McDonnell as our guest to the gymnastics training centre. (Read about his previous visit). This week we were over the moon when Declan rang to say he was returning with the City Manager. Like most first time visitors to the training centre, Mr. McGrath was impressed. Over the next half hour, we showed our visitors through all parts of the gym, and told him everything about our club: how we’d outgrown the community centre, and how we’ve continued to grow until now, and how we could continue to grow further had we more space. We told him about our amazing staff of 3 full time and 15 part time coaches, and Carol Hynes, our administrator who holds it all together. We told him that we’d recently applied for planning permission, and that with the building now up for sale by the landlord, there was some uncertainty. Brendan expressed much interest in what we are doing. He asked many questions, and requested a tour of the upstairs. By the time his visit was over, there was one thing he knew for certain: gymnastics is good for children – it’s an important sport in Galway, and we would like to see it included in the Galway City Strategic Plan. Thank you, City Manager Brendan McGrath for coming to visit us. And thank you Declan McDonnell for bringing him!